The first study abroad trip for Wright State University students interested in rehabilitation services and disability studies was an eye-opener — a good one. 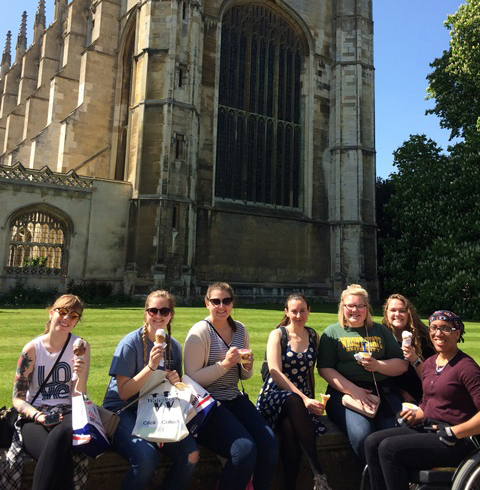 During their 10-day trip to England from May 1–11, the eight students — three of whom have disabilities — demonstrated their community accessibility evaluation skills by meticulously planning their itinerary for a day in London by checking with historical sites, restaurants and other stops to make sure they were fully wheelchair-accessible. They learned that the Tower of London was only 20 percent accessible, so they switched gears and planned a stop at Parliament instead. But when they got on a train and arrived at the first station, they discovered that the elevator and other accessibility options weren’t working. After some deliberation, the group decided to split up and take two different buses. In all, what should have been a 90-minute trip to their first destination took an hour longer. 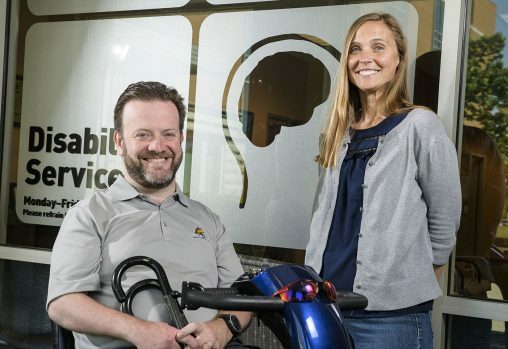 Thomas Webb, director of Wright State’s Office of Disability Services who co-led the trip, called it one of those “pivotal moments” when a lightbulb went off in the heads of the students without physical disabilities. The London visit was one of many valuable learning experiences for the students during the study abroad trip, which was organized by Gina Oswald, program director of rehabilitation services in Wright State’s College of Education and Human Services. Effective July 1, Oswald will be faculty director for the Center for Teaching and Learning. The seeds of the trip were planted in 2015, when faculty and staff from Anglia Ruskin University in England came to Wright State to begin the steps that would lead to a partnership agreement. Oswald visited Anglia Ruskin the following year to begin setting up the study abroad program. Anglia Ruskin is a school of nearly 40,000 students, with campuses in Cambridge, Chelmsford and Peterborough. It supplies many of the region’s teachers, nurses, midwives and social workers. The study abroad trip was designed for rehabilitation services majors and disability studies minors. But any student interested in the topic of disability could come, and some did. The goal of the trip was to compare and contrast accessibility in England with that of the United States. “We actually did an audit of a museum to look at their accessibility — like measuring doorways, elevator widths, looking at bathrooms,” said Webb. Students on the study abroad trip relax outside a college at Cambridge University. From left: Abby West, Lizzy Carnahan, Lindsey Strickland, Rose Guy, of Anglia Ruskin University; Maggi Hole, Becca Endicott and Renaissance Craver. The students spent much of the time at Anglia Ruskin’s campuses in Cambridge and Chelmsford. They learned about research using navigational echo-location for people who are blind. They saw demonstrations of music therapy. They were told about employment support and academic accommodations for students with disabilities as well as accessibility and inclusion aspects of recreational sports. The students also met with Anglia Ruskin architecture students, who were presenting their final projects. The group also spent a day in Norwich, a historic town known for being one of the more accessible communities. During a tour of a church and museum in Norwich, the group came upon a traveling exhibit that detailed the history of the Paralympic Games, a major international multi-sport event involving Olympic athletes with a range of disabilities. “To me, that showed that the region was really valuing accessibility,” said Webb. The church, which was built in 1100, featured a modern glass elevator that had been installed and accessible restrooms. Webb said that when it comes to accessibility, there are some things England does really well and other things the United States does really well. Many of the trains in England have no-step platforms or ramps to aid accessibility, and buses have a spot for a person in a wheelchair. On the other hand, the cobblestone streets can present a navigation challenge for wheelchairs and scooters. Most of the Wright State students had never been out of Ohio. “By the end of our trip, we really saw some amazing independent travel skills, a real blossoming of ideas and really understanding how much goes into making decisions about going places for a person with a disability,” said Oswald. There are plans to return to the United Kingdom for another study abroad trip in 2019. And a group may attend the Rehabilitation International World Congress in Denmark in 2020. “We’re very excited to be able to keep offering these opportunities,” said Oswald. Visit the 2018 student trip blog at blogs.wright.edu/learn/disability-uk/. For information about upcoming trips, contact Gina Oswald at gina.oswald@wright.edu or Thomas Webb at thomas.webb@wright.edu.